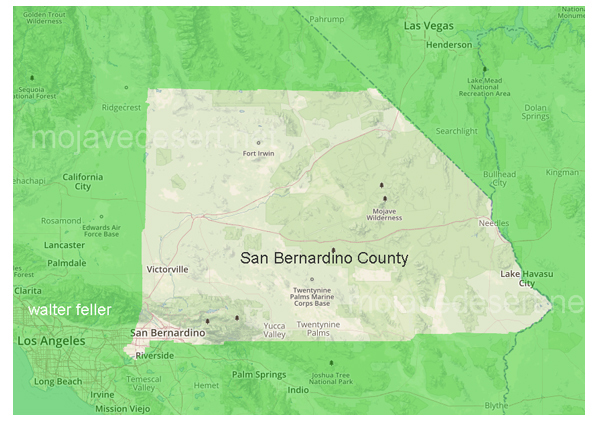 San Bernardino County is not only the largest county in California, but it is the largest in the United States. As a county it has been uniquely endowed with rich mineral deposits. Large deposits of gold have been mined at Stedman and Vanderbilt, with smaller but still important deposits at Alvord, Oro Grande, Old Dad Mountain, Dale and Nantan, Calico, Ivanpah, Waterman and Providence were the largest silver deposits, with lesser, but important deposits in the Mescal Mountains and at the Death Valley Mine. The most important copper mines are the Copper World and the Bagdad Chase (known usually for its gold production). Salt Spring, along the Mormon Trail that connected Salt Lake City and San Bernardino, became the first confirmed gold discovery in the county in 1849. The 1850s are a silent period, but in the 1860s the prospectors who fanned out looking for another Comstock Lode or La Paz gold placers discovered ore in the Clark, Providence, New York, Whipple, Turtle and Sacramento mountains and in the Slate Range. Most of these discoveries were made within two days travel of major transportation routes: the Mojave Road or the Colorado River. Between the late 1870s and World War I, mining activity continued with fairly even intensity, with gold mining surpassing silver early in the 1890s. 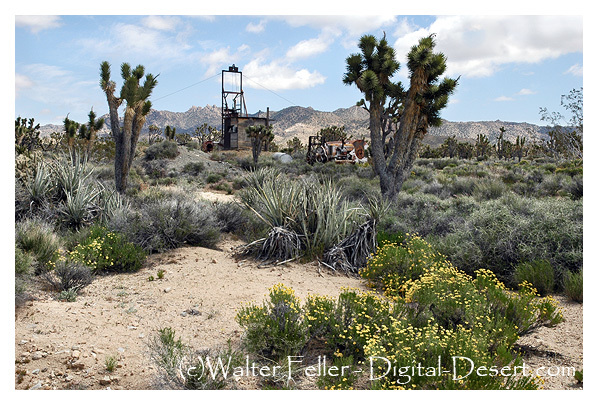 Vanderbilt, Stedman, Hidden Hill and a host of small gold rush boom-towns followed the discovery of gold at Goldfield and Bullfrog, Nevada early in this century. Except for a brief period after World War I when silver prices were high, low metal prices and inflation put a damper on mining in the 1920s. However, with the Great Depression of the 1930's and an increase in the price of gold by nearly $15 an ounce, many small operators reactivated old mines. The region around Barstow, Vanderbilt, Stedman and Dale were the principal centers of mining activity until World War II. During World War II, iron was extracted from the Vulcan Mine in the Providence Mountains, and the Bagdad Chase Mine remained active. Since the war there has been sporadic mining of gold, silver and tungsten in the county. A major new mine opened during the 1950s, the Mountain Pass rare earth mine. Recently, exploration has outlined potential large tonnage molybdenum properties in the New York and Ord Mountains, copper in the Cooper Basin area of the Whipple Mountains and gold in the Clark Mountains. of the Mescal Range, Ivanpah Mountains and south Clark Mountain.